New Delhi, April 27: Modi Government is all set to implement recommendations of Seventh Pay Commission. Reportedly, the notification for the 'increment process' will be issued in the month of June. 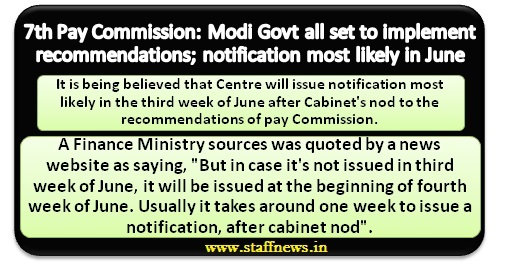 It is being believed that Centre will issue notification most likely in the third week of June after Cabinet's nod to the recommendations of pay Commission. A Finance Ministry sources was quoted by a news website as saying, "But in case it's not issued in third week of June, it will be issued at the beginning of fourth week of June. Usually it takes around one week to issue a notification, after cabinet nod". Ministry is also hopeful that Empowered Committee of Secretaries which is looking after the recommendations at the moment, will submit its report by June 15. Most likely, increased payout will be handed over to central government employees earliest at the end of June or latest by July. Reports suggest that Empowered Committee of Secretaries which has been entrusted the responsibility to overview recommendations will not make much change into it. Earlier, Modi government conceded that implementation of new pay scales proposed by the 7th CPC is estimated to put an additional burden of Rs 1.02 lakh crore which is around 0.7 per cent of GDP. Modi Government is all set to implement recommendations of Seventh Pay Commission. Reportedly, the notification for the 'increment process' will be issued in the month of June.